Although colouration may vary this species is usually a rich golden colour. This species has no barbules and the fins are reddish and very rounded. The dorsal fin is also rounded but it is convex, unlike all other carp which have concave (rounded inwards) dorsal fins. 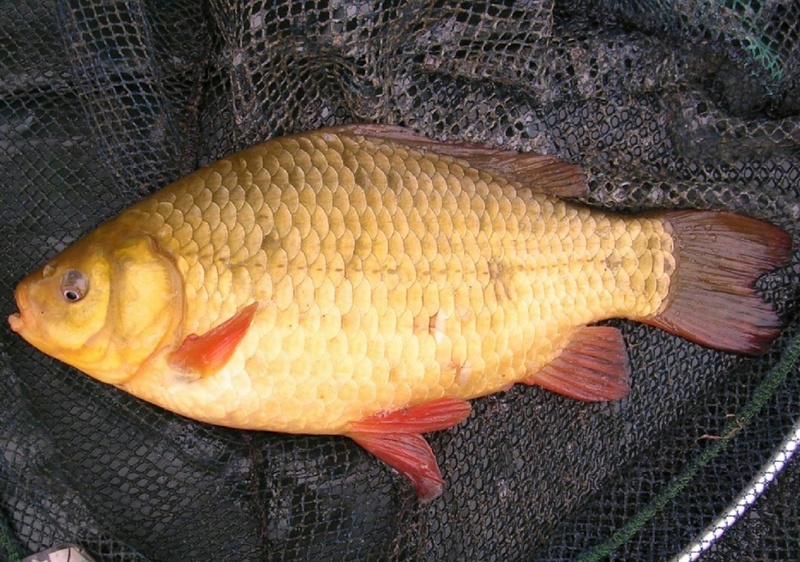 Crucian carp/goldfish hybrids can only be distinguished with certainty by DNA testing. The average fish weighs less than one pound but the current British record stands at a very impressive 4lb 9oz 9dr. Usually a species of still water lakes and ponds, but may also be encountered in slow moving water bodies. All year round but most often encountered in warmer months. Like all carp, Crucian Carp can spawn any time between the beginning of May and the end of July. All they require is warm weather and warm water. Widespread and fairly frequent in much of England. Uncommon in Leicestershire and Rutland. Found only in the Rivers Soar (at Leicester) and Welland; but probably more common in lakes within VC55.